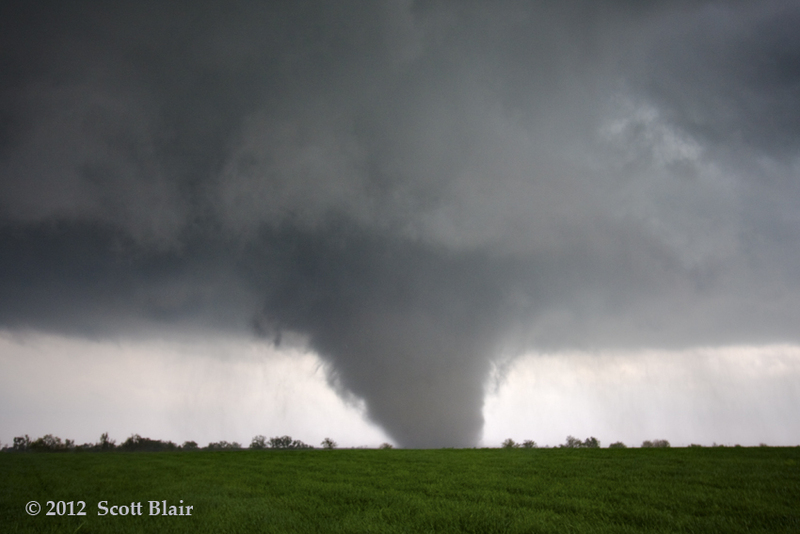 This was one of many tornadoes during the 14 April 2012 outbreak, but one of the most intense and long-lived of the event. 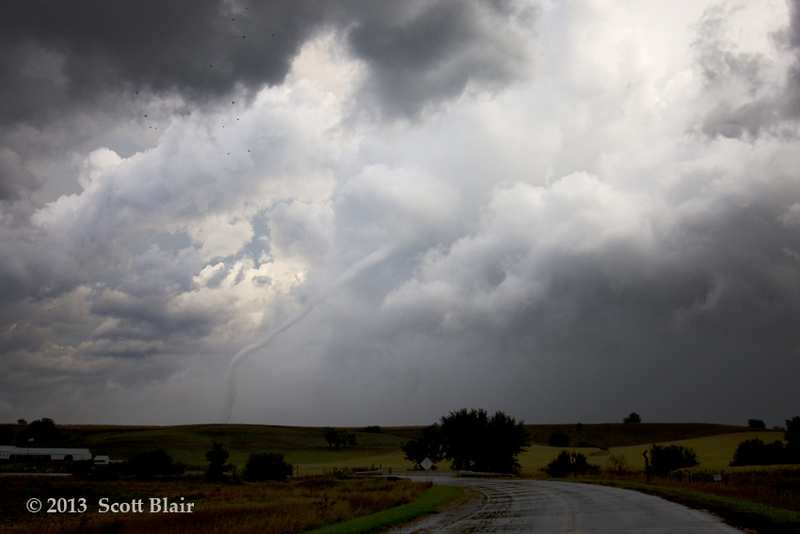 I followed this tornado for over 30 minutes and eventually stopped on an east-facing hill that would presumably contain a favorable view of the vortex crossing the road. 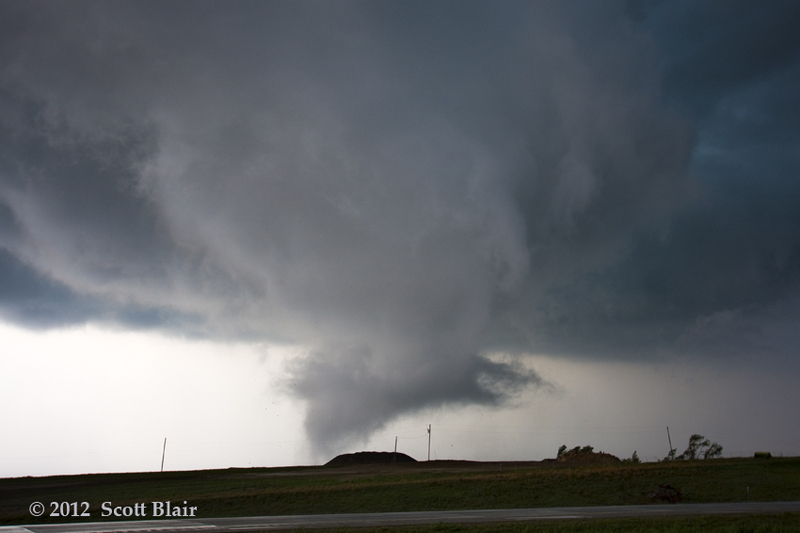 The tornado’s audible roar was very impressive as it approached the road. Most of the precipitation had ended at my location, and the high-contrast combined with the rapidly rotating tornado made for a spectacular sight. The circulation crossed the road approximately one-quarter mile east of my location, lofting pieces of vegetation high into the sky. I crossed the damage path along Highway 4 where several trees had been severely damaged. 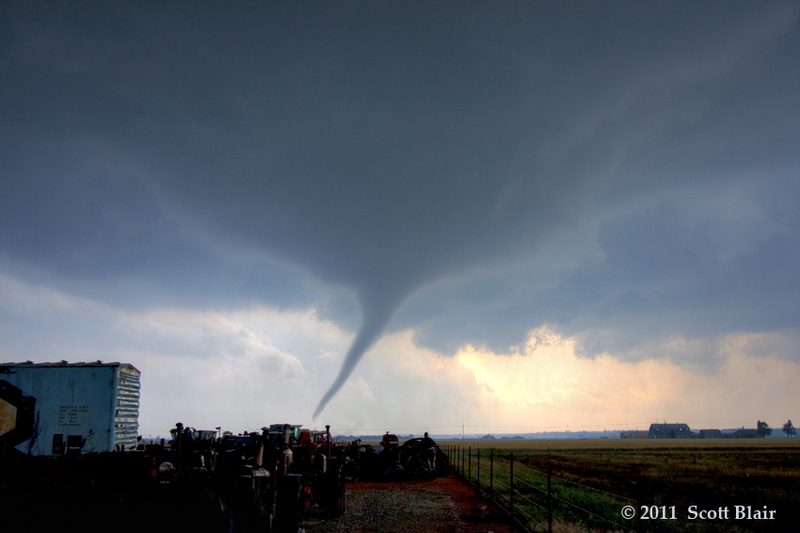 The tornado unfortunately struck a farmstead shortly after crossing the road, resulting in an EF4 damage rating. 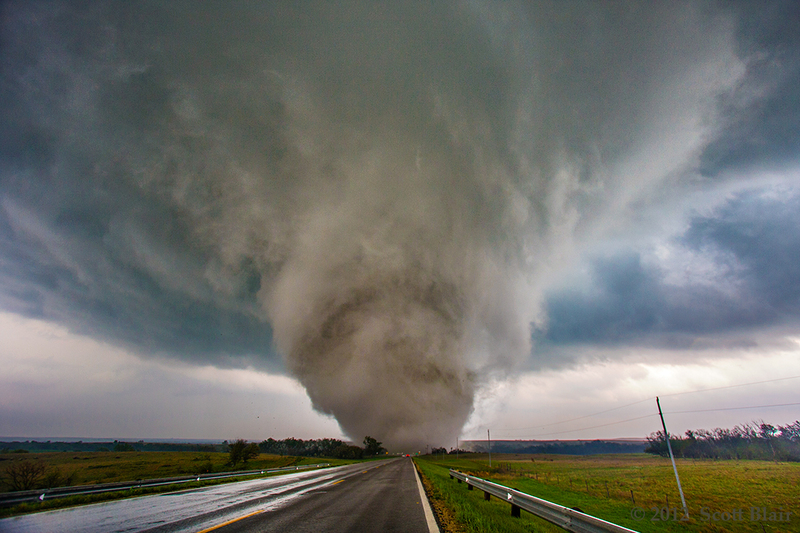 The violent tornado continued on its northeast journey across sparsely populated countryside. 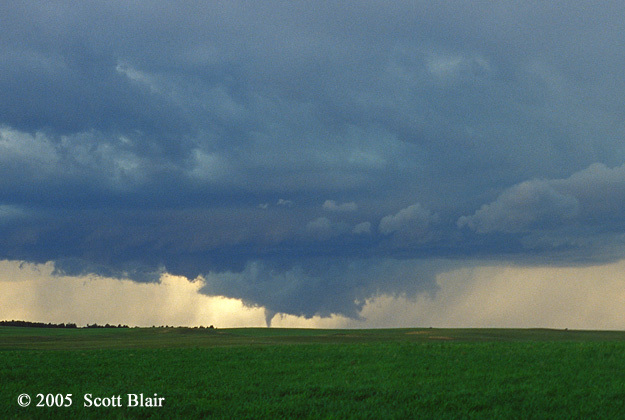 The flat and colorful terrain of the Smoky Hill River basin made for a very picturesque sight as the tornado exited from sight. 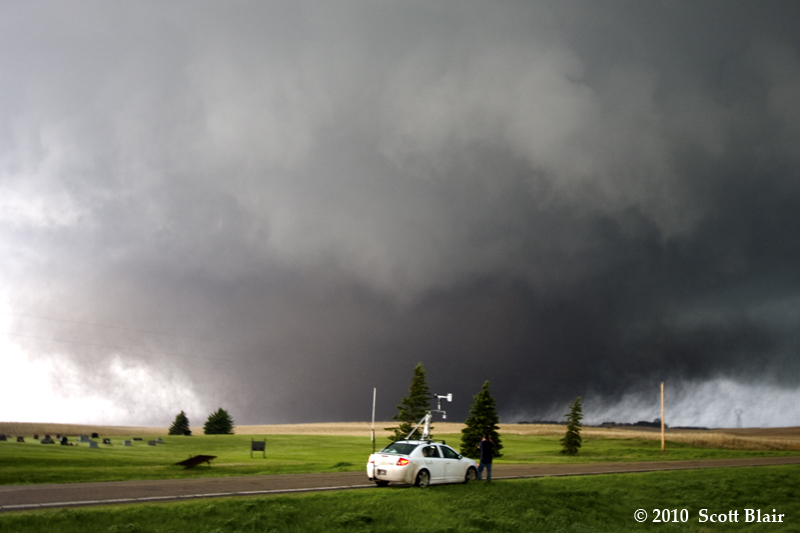 The T1-T5 sequence of photos displays the violent EF4 tornado near Bowdle, SD. Fortunately, only limited damage occurred with this monster tornado. 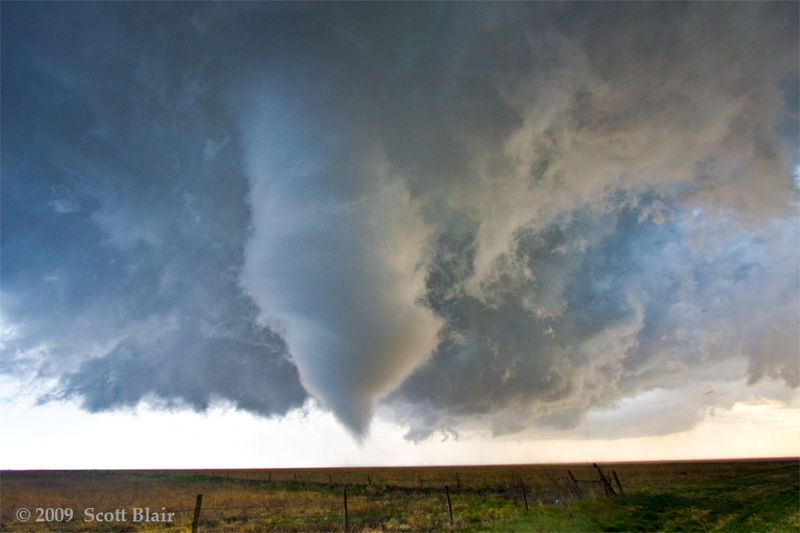 The visual vortex evolved from a cone into a pure wedge tornado. The storm structure combined with the rapid circulation made for a very photogenic and memorable experience. The eastern periphery of the tornado finally crossed Hwy 47. 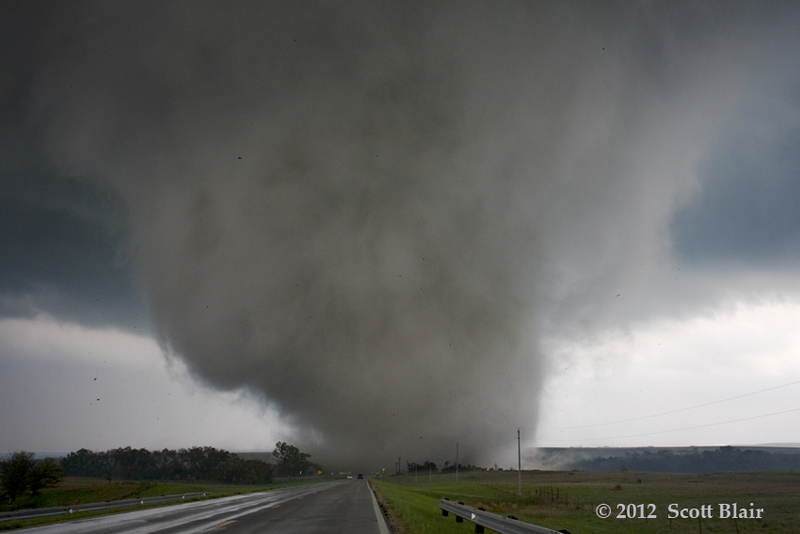 The large tower to the right of the road would eventually fall as the circulation passed nearby. 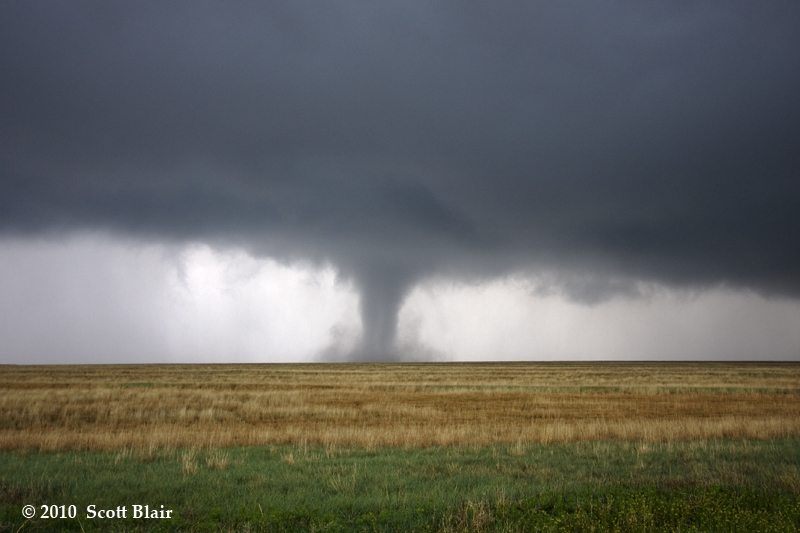 Following the Bowdle wedge, a second tornado was observed ~3 miles NE of Bowdle at a new cyclic region of rotation. 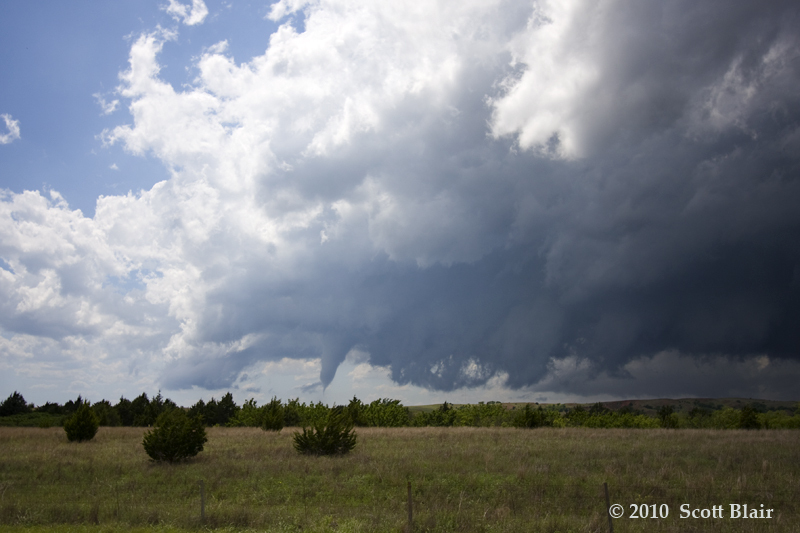 Relatively high-based convection produced these two landspout-type tornadoes near Rago, KS. 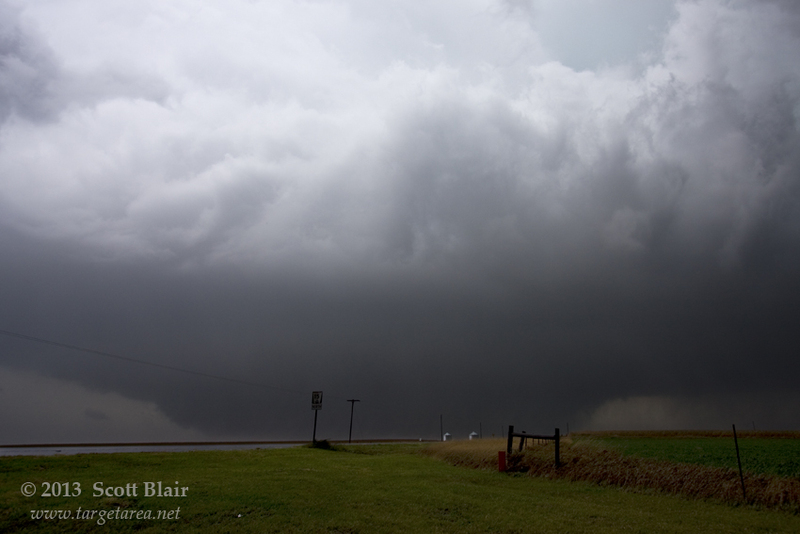 We stopped roughly one-quarter mile from both of the tornadoes, to watch them cross Highway 14. Very heavy rain and occasional hail made for some challenging photography as I was constantly wiping my camera off. 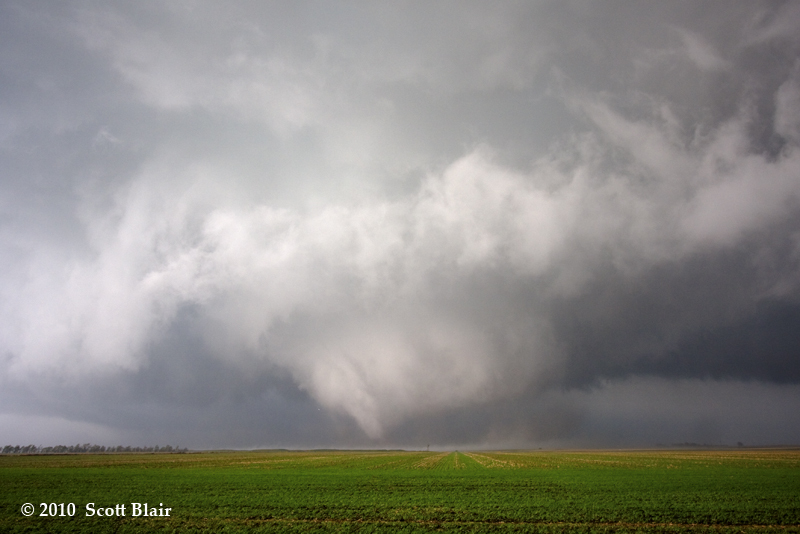 The tornadoes were very photogenic, with a subtle illumination of white color with the latter one. 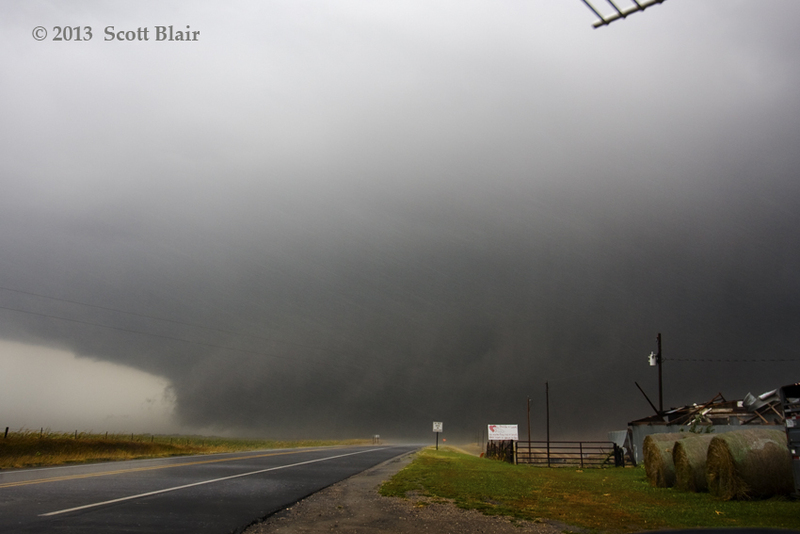 The second tornado moved across a plowed field and lofted a tremendous amount of dirt around the circulation. 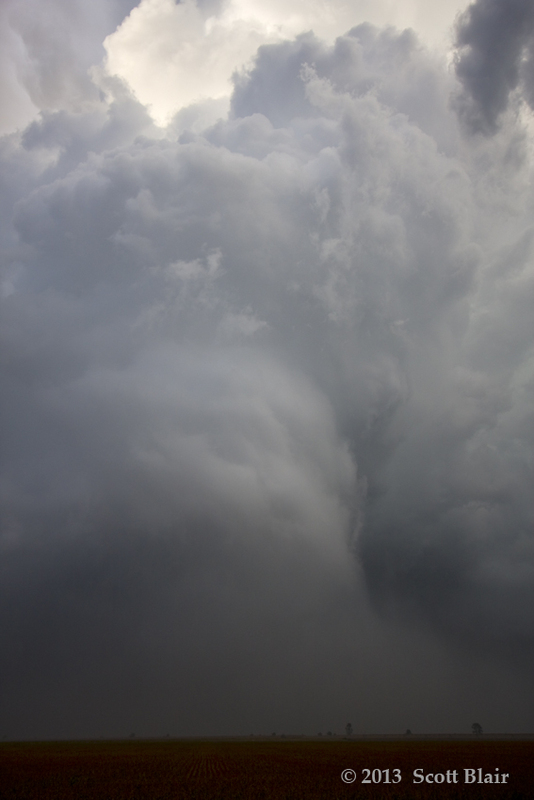 The near-ground cyclonic motion was very impressive, and the audible roar was quite loud. 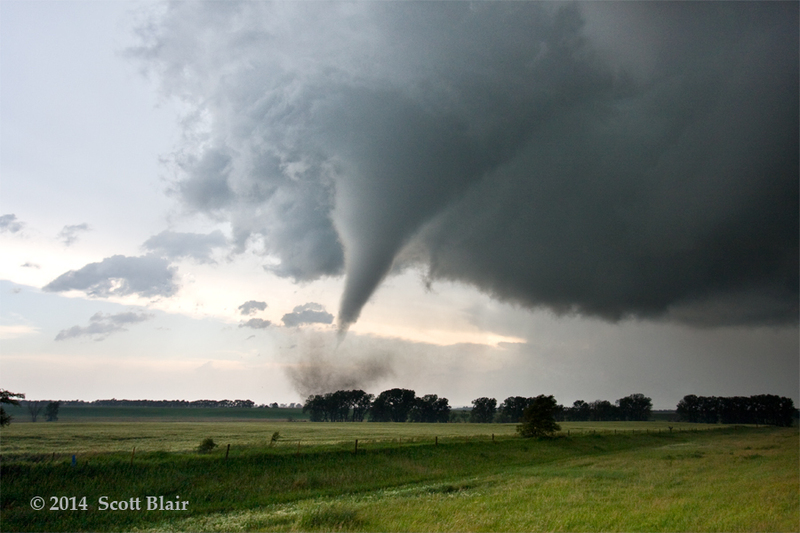 A localized tornado outbreak occurred over central South Dakota with 12 different tornadoes documented from the same storm over a two-hour period. 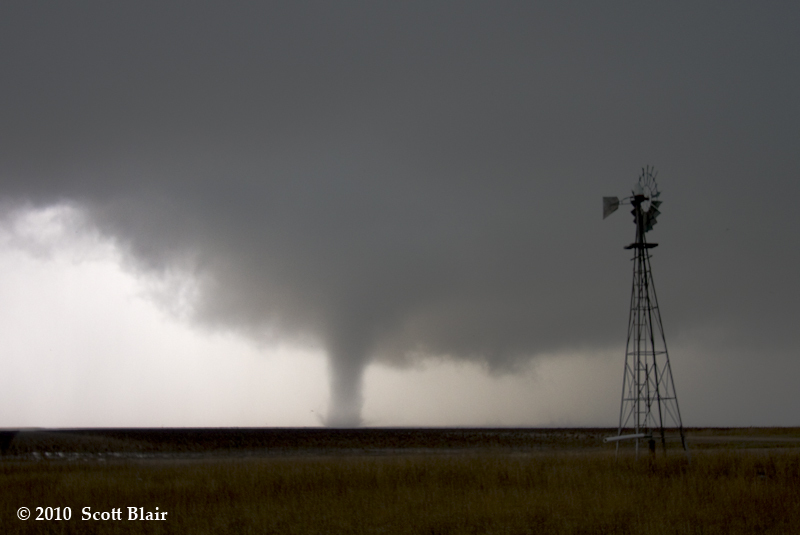 We observed half of those and fortunately most of the tornadoes tracked across very rural areas. We watched the Lane-Alpena tornado at close range early in its life cycle as the RFD gradually exposed the primary updraft. 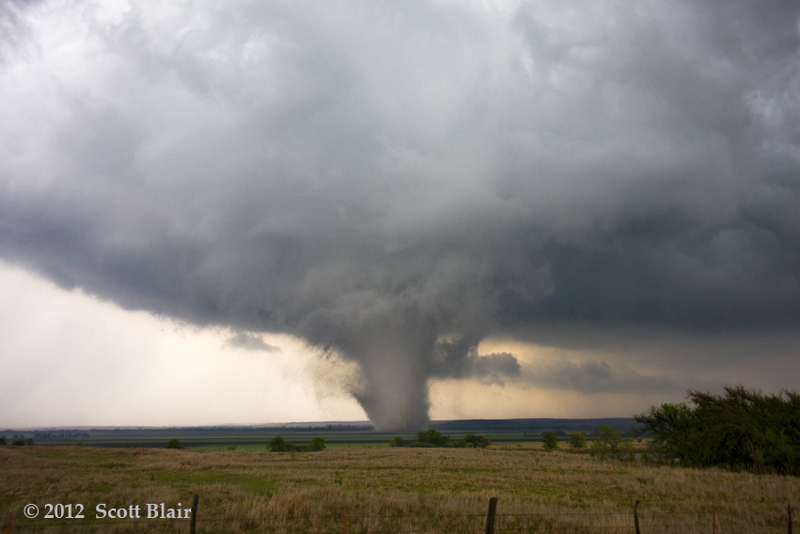 This tornado intensified and ended up impacting some structures, yielding an EF4 rating. 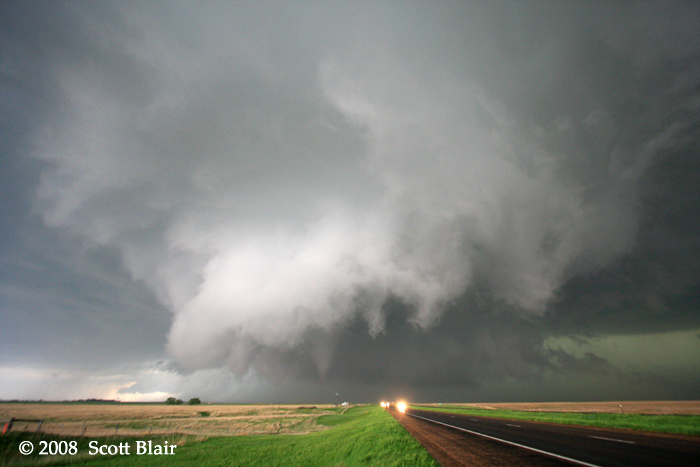 This huge wedge tornado was part of a prolific fall outbreak. The tornado grew to nearly 1.5 miles wide and struck the eastern side of Wayne resulting in EF4 damage. 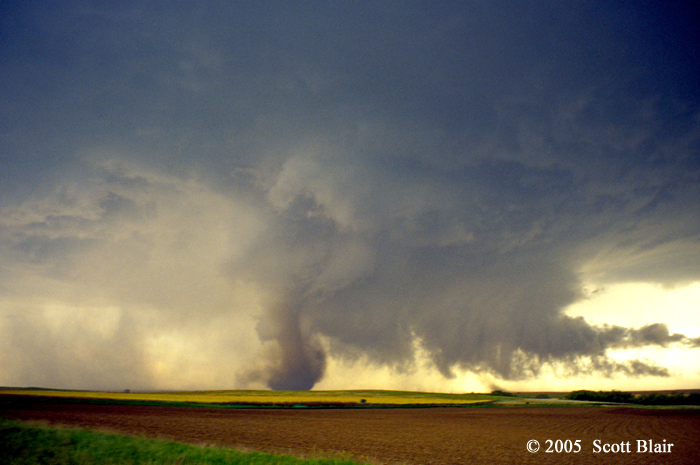 The large wind field surrounding the tornado, in addition to fast storm motion and low cloud bases, made for challenging opportunities for photography. 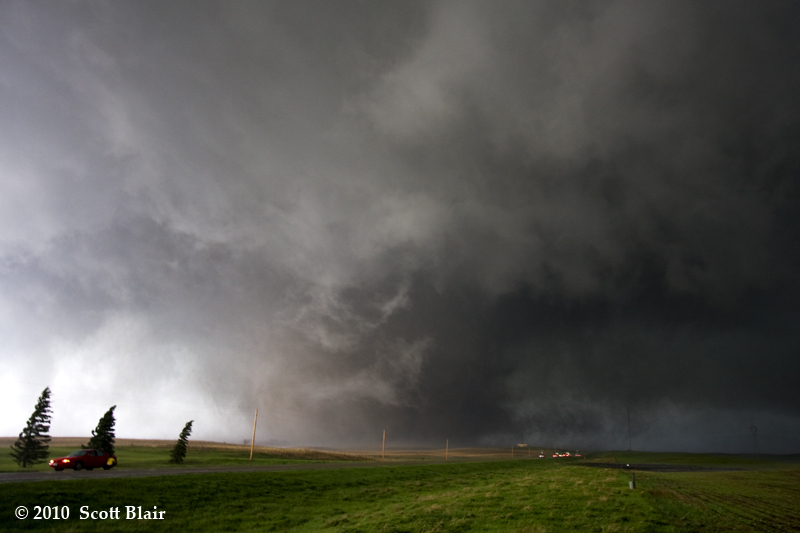 This tornado occurred in a very rural area, taking us through an extraordinary journey through Highway 193 before meandering to the Dorsey Mansion State Monument along Road "A-14". 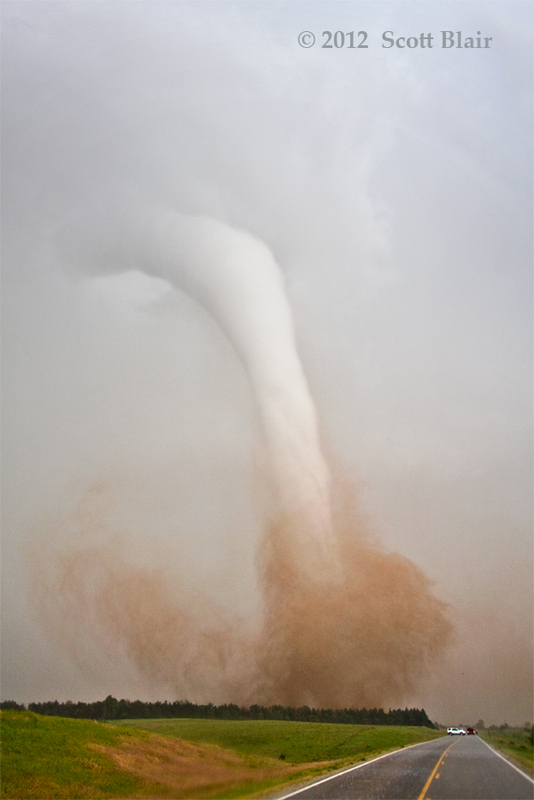 The tornado put on a spectacular photogenic show at relatively close range, with a whitish-gray condensation cloud swirling about the sandy orange soil, while pockets of blue sky surrounded the white parent updraft tower. The remote location afforded a rare opportunity to experience a marvelous sight with the absence of human-related sounds or sights, which in these days are increasingly difficult to achieve. 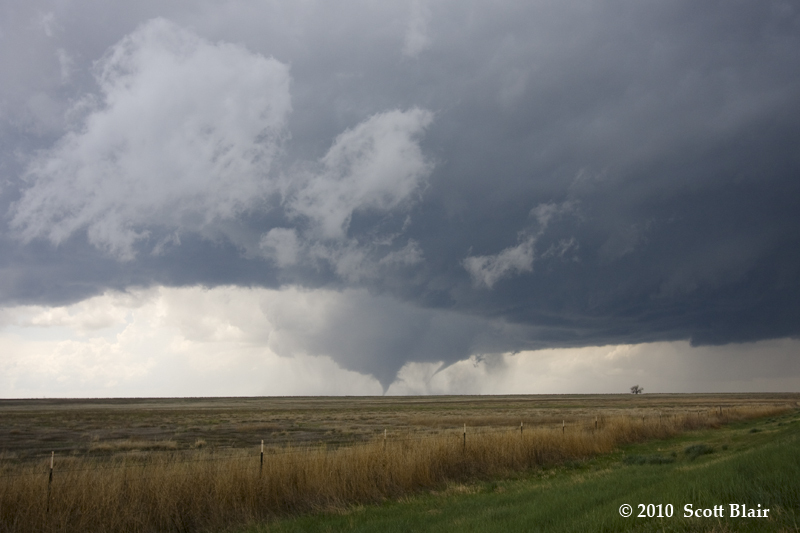 I was fortunate to observe ~13 tornadoes across eastern Colorado, generally along a SW-NE corridor from the John Martin Reservoir to Eads to Cheyenne Wells. The majority of these tornadoes were from separate occluding areas of rotation. 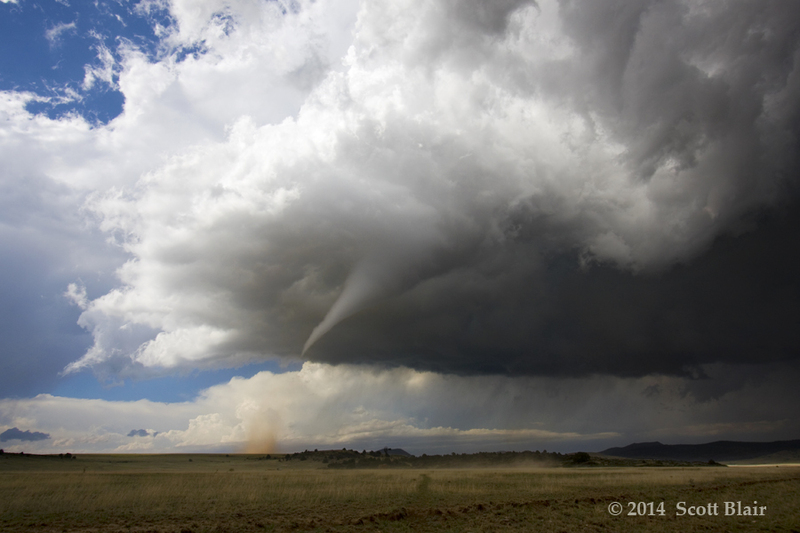 I watched the full evolution of the first tornado near Hasty, CO. 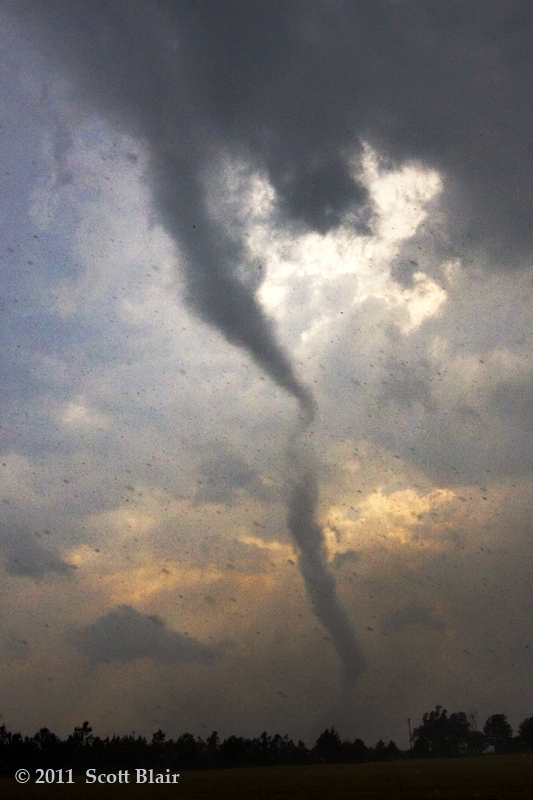 This 10 minute tornado transitioned from a bowl-shaped tornado into a cone. A secondary satellite tornado developed on the outer circulation. 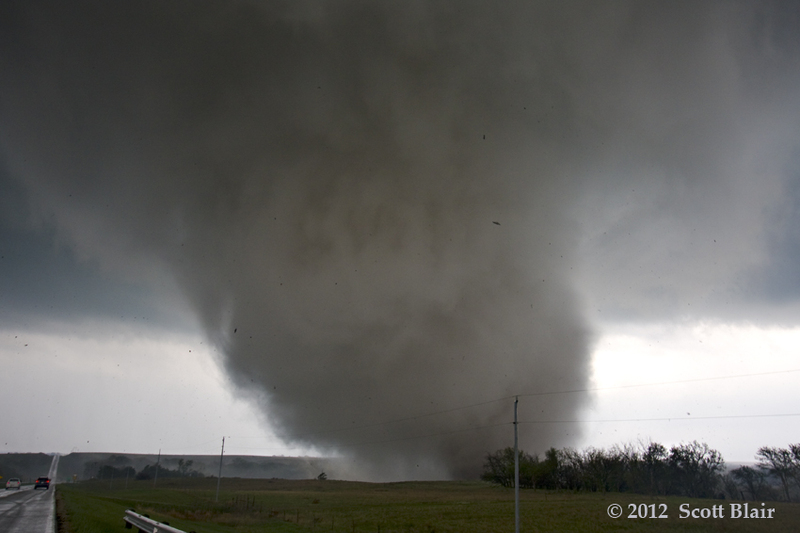 T4-T5 was ~200 yards wide and eventually evolved into a stovepipe tornado with an impressive drill-press debris fan. The tornado moved virtually due north, paralleling my road about 1 mile west of my location for nearly 15 minutes. 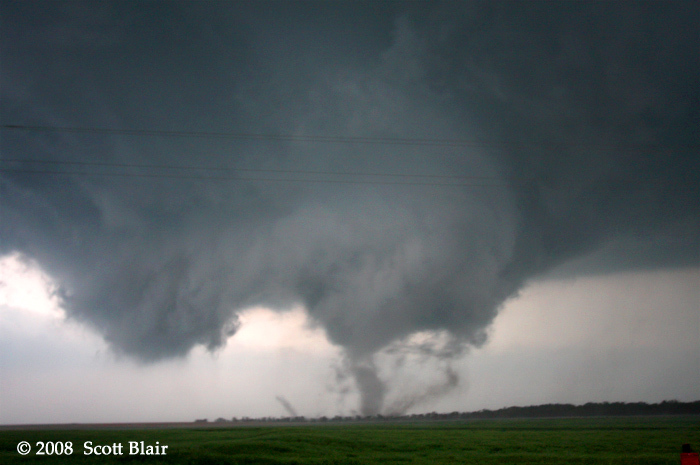 The rotational motion was impressive with the particular tornado, and certainly appeared to be the most intense vortex I observed this day. 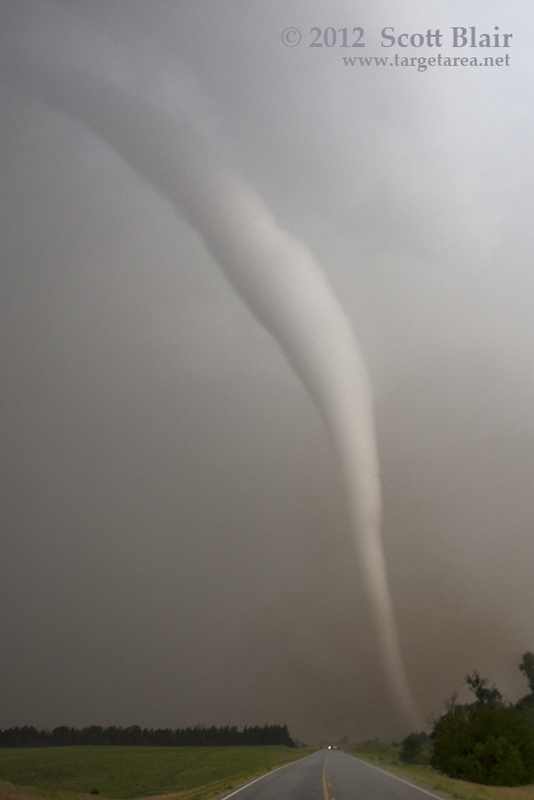 This tornado developed at close range and went through several evolutions of shapes within its 10 minute lifespan. I deployed a research-grade pressure probe within 200 yards in the middle of snapping photos, but only managed a 1 hPa deficit. 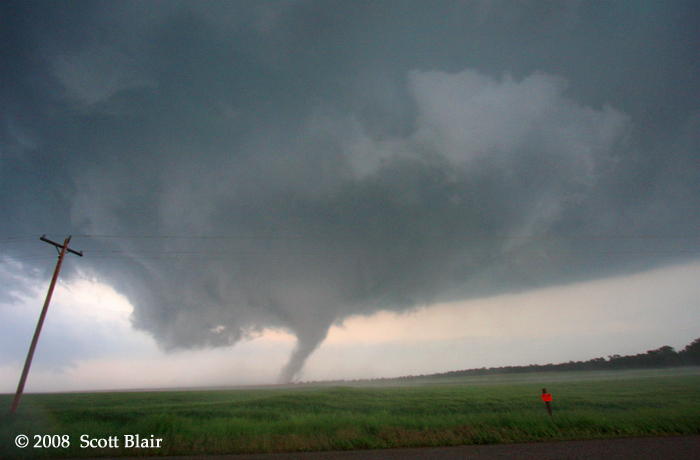 Regardless, a beautiful tornado with the only damage limited to a few snapped power poles. 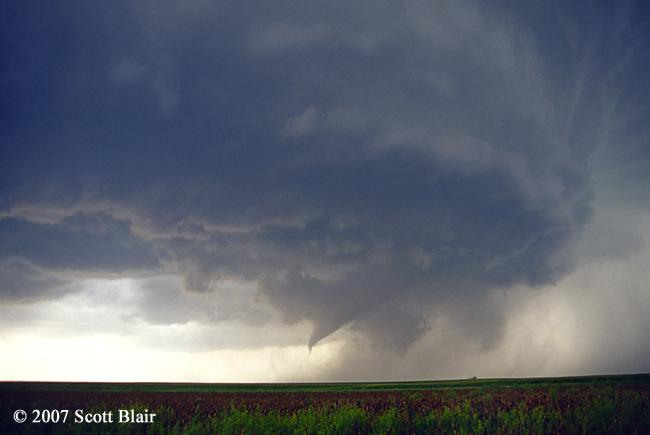 One of the best examples I’ve seen of tornado evolution was observed on 10 June 2004. 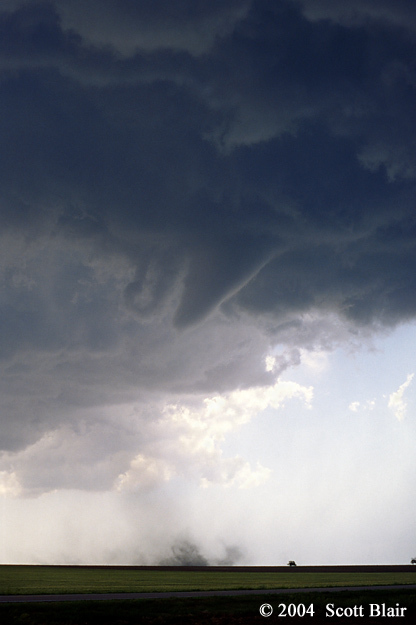 The tornado developed near Interstate 80 with a funnel aloft and debris whirl underneath. 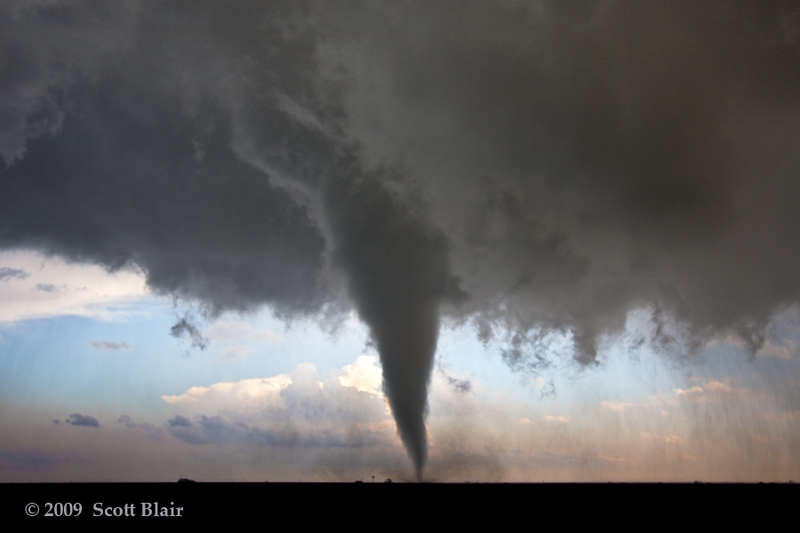 With time, the vortex became a stovepipe tornado and eventually roped out north of Big Springs, NE after nearly 40 minutes on the ground. 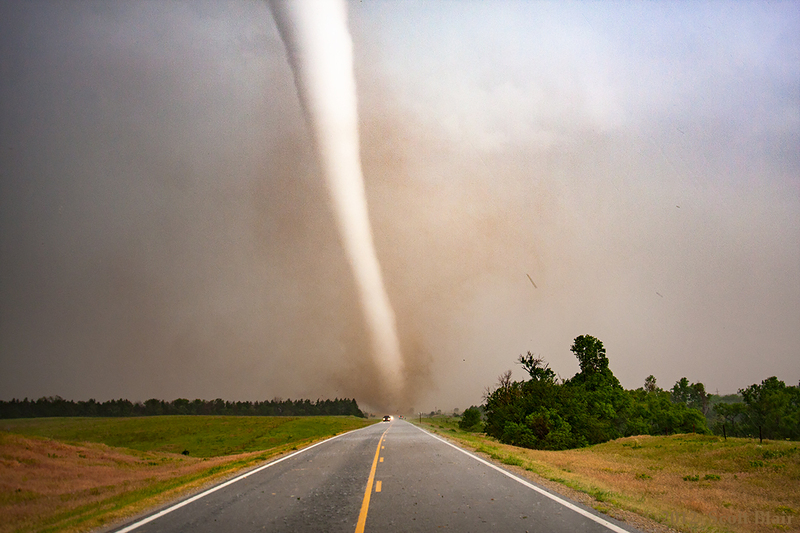 We paralleled the tornado for the majority of its life cycle on a dirt road, allowing for excellent contrast during the event. 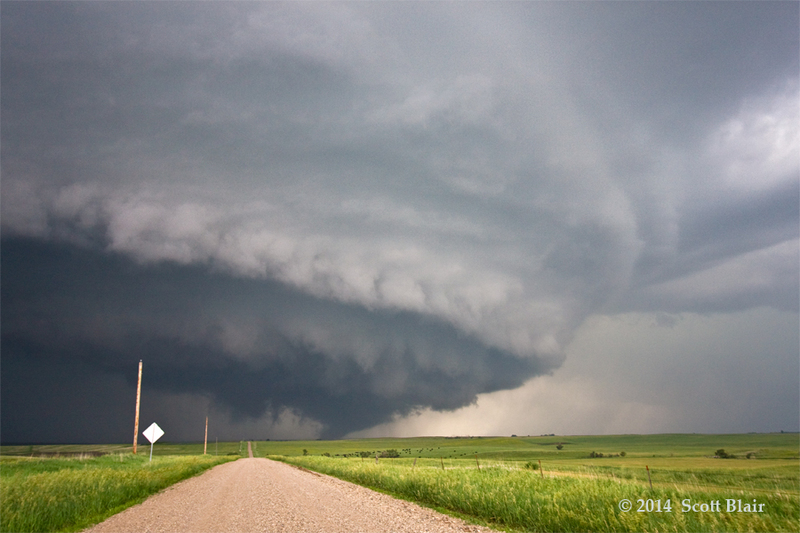 This long-lived supercell was initially classic in structure and produced a tornado early in its lifecycle. Precipitation gradually increased with the storm and became wet-classic to HP in nature, making observations very tedious. 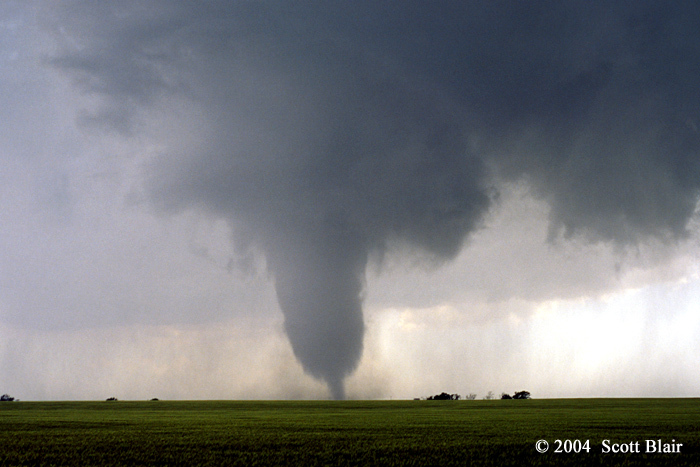 Occasionally, a tornado could be observed within the dense precipitation wrapping around the low-level mesocyclone. 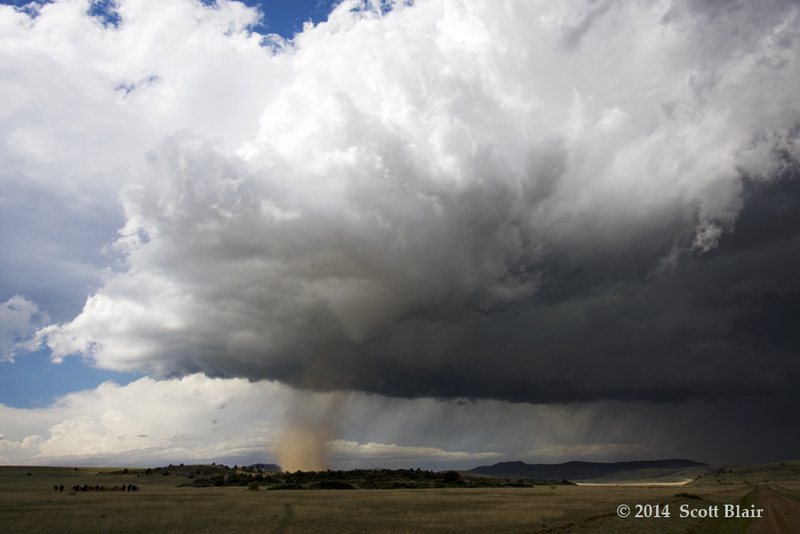 This tornado put on a spectacular multi-vortex display just north of Rd 380, south of Waconda Lake, near sunset. 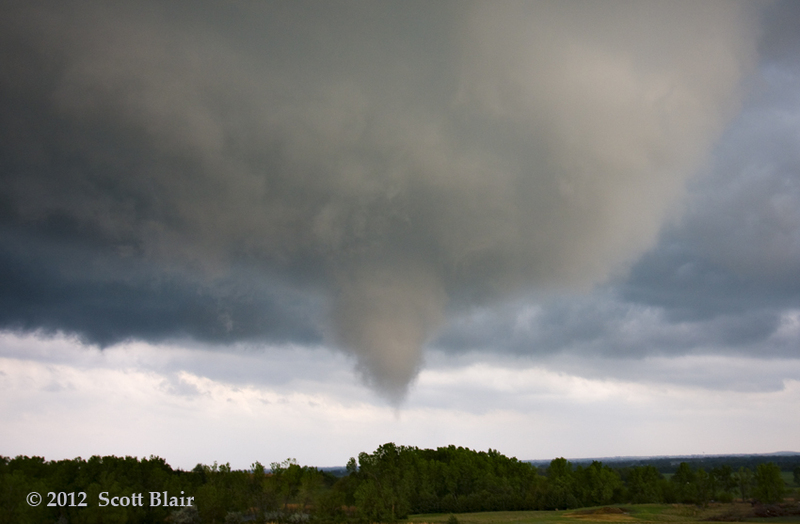 Strong RFD and inflow winds were encountered while photographing the tornado at close range. 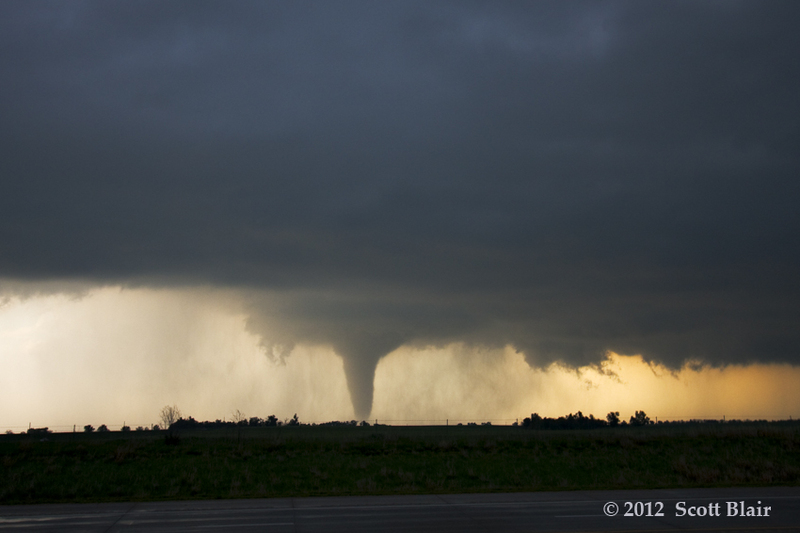 The tornado evolved into a large tornado near dusk with EF3 damage inflicted to the western side of Jewell, KS. 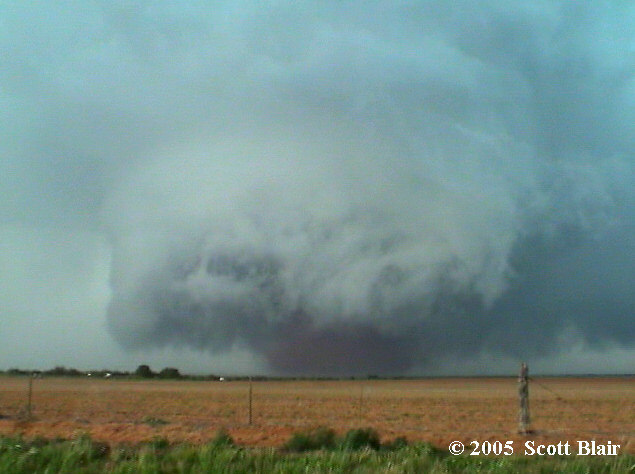 A classic supercell spawned a violent EF4 tornado, initially touching down on the outskirts of Chickasha, OK. The tornado neared 1.5 miles south of our location as it quickly moved northeast, very near I-44. 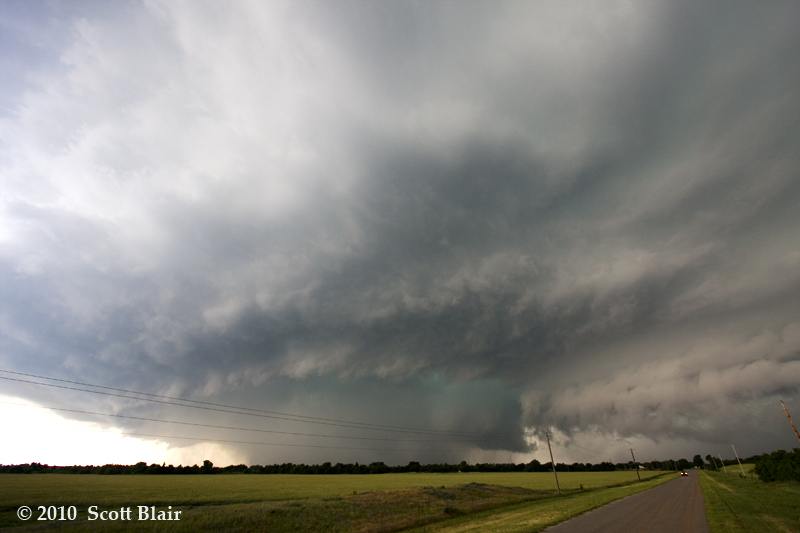 As it entered an urban landscape, we drove south to observe another classic supercell. It took less than 15 minutes to depart the old storm, head south on I-35, and first spot the ongoing tornado approaching Goldsby, OK. The tornado was beginning to move in a northerly fashion as the parent circulation occluded and the tornado transitioned into a rope. 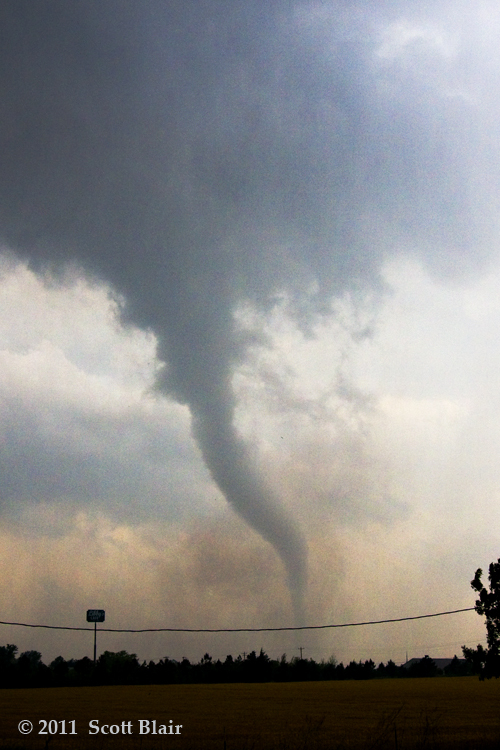 The tornado finally decayed in a snake-like, wispy fashion approximately 1.5 W of our location. An incredible amount of debris rained down from the sky. 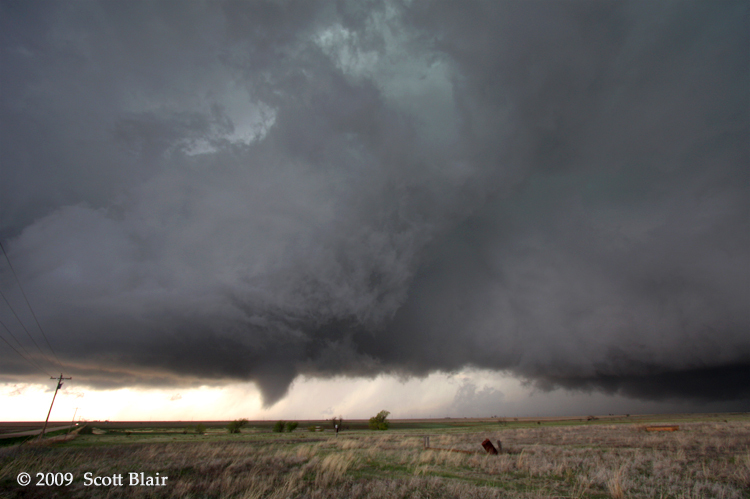 A long-lived supercell slowly moved across northern Oklahoma producing at least 6 tornadoes. 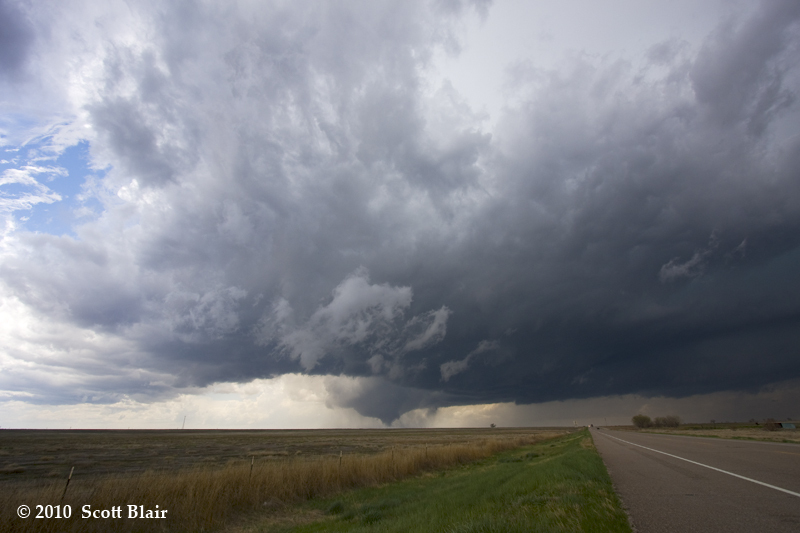 Most of these tornadoes were difficult to observe with precipitation masking the features. We were fortunate to capture two photogenic tubes including the first one observed of the day with a beautiful foreground and storm structure. 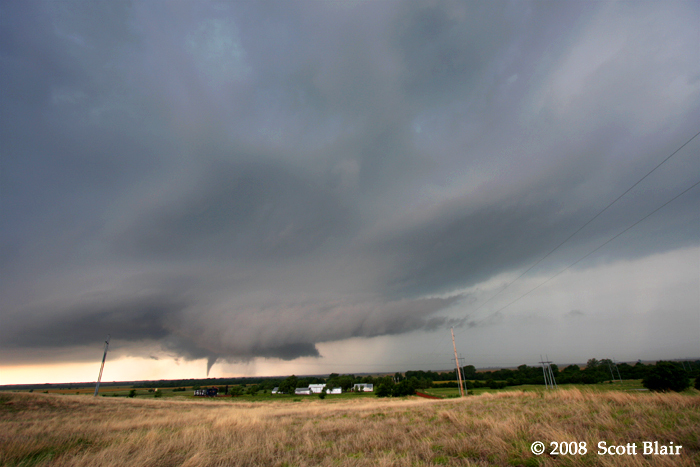 A strong tornado was spawned from a wet-classic supercell storm southwest of Hill City, KS on 9 June 2005. 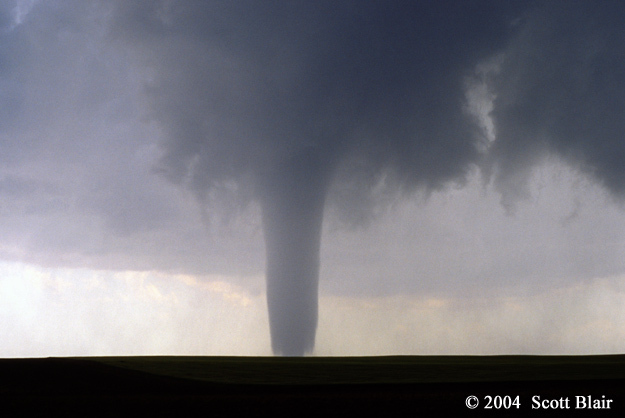 The tornado was initially cone-shaped before evolving into a wedge. 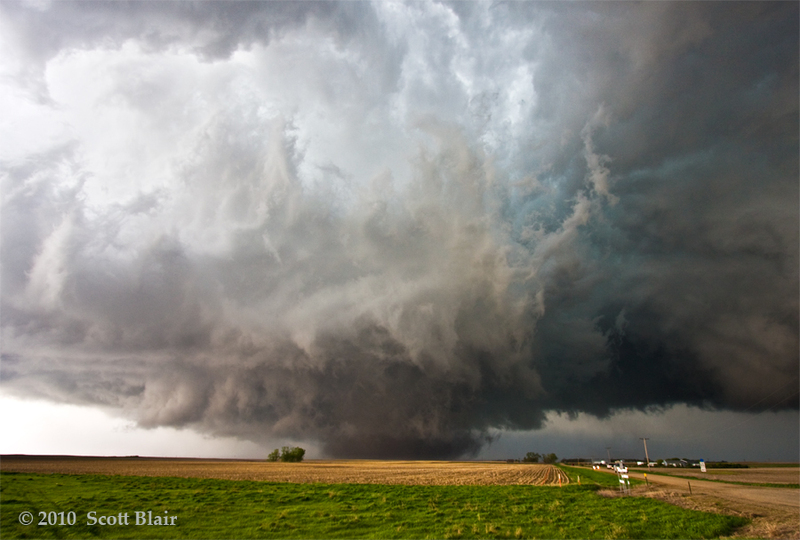 The image displays the incredible storm structure with a typical Kansas foreground. 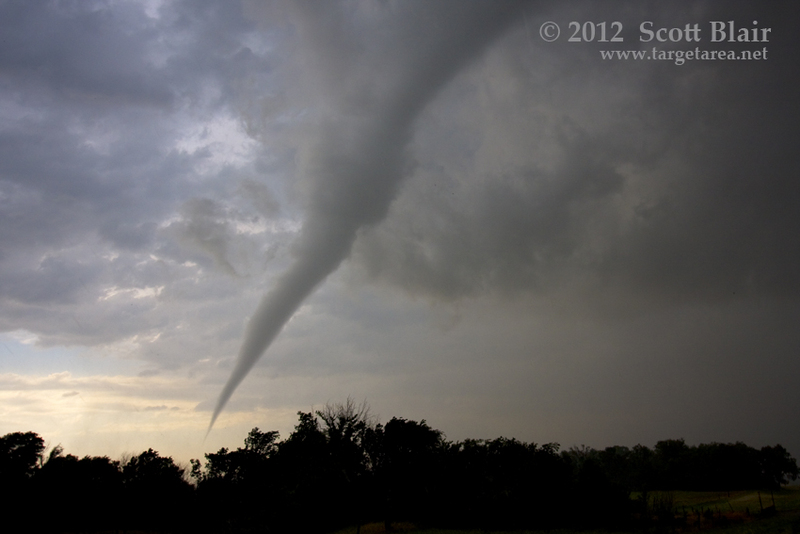 The tornado passed south of Hill City and very close proximity to our location with a loud audible roar (T2, video). 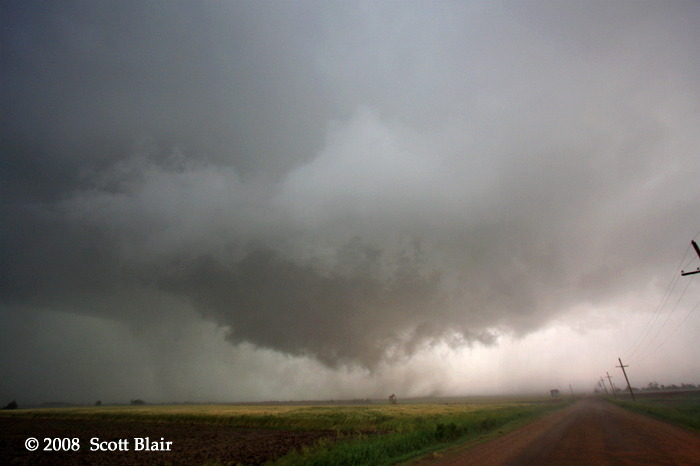 The storm was cyclic per second photo with the white tornado and its associated updraft in the process of occluding. 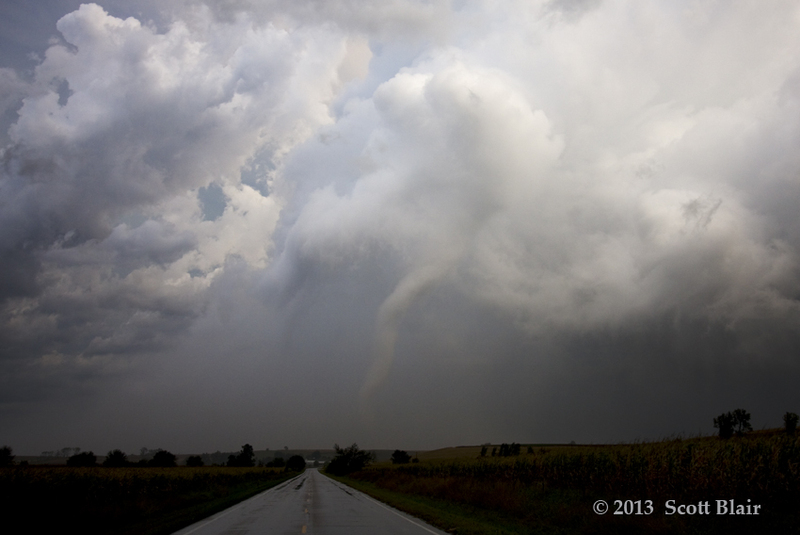 To the east, a new tornado developed near Stockton, KS and eventually grew fairly sizeable. 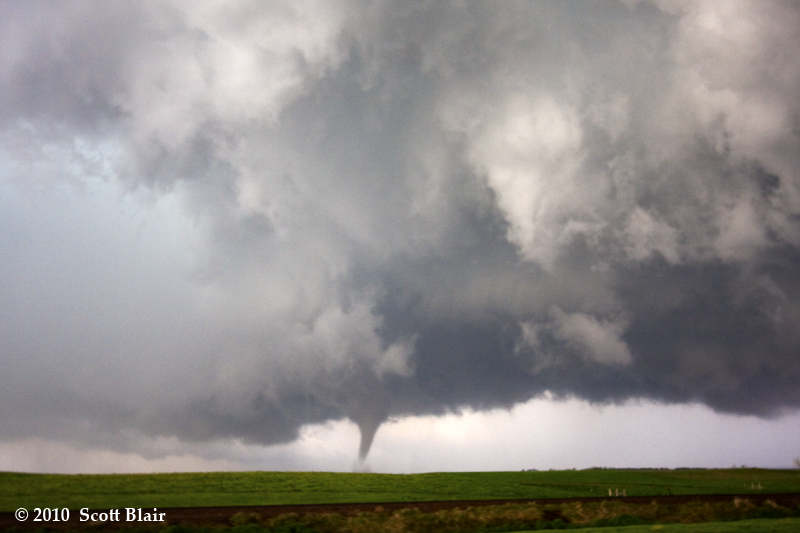 The long-lived supercell that earlier produced an EF4 tornado southwest of Salina produced another tornado northeast of the city near Solomon, KS. This multi-vortex tornado was weaker, with several dancing dusty vortices as it crossed I-70 just west of the Niles Road exit. 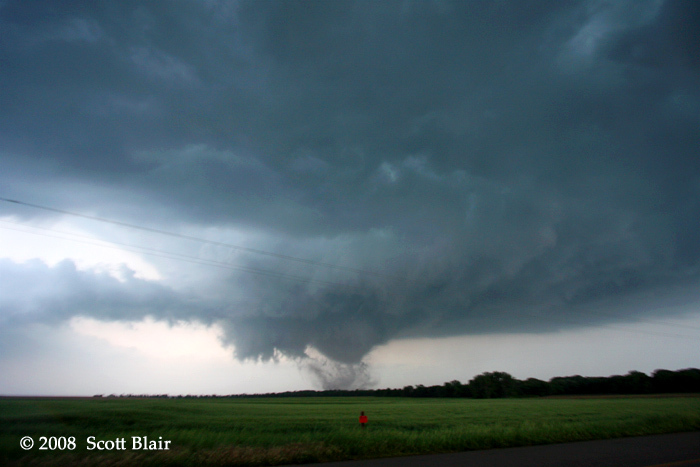 The tornadic circulation evolved into a stovepipe tornado, and this structure lasted for nearly ten minutes. As sunset approached, a golden hue overspread much of the sky. 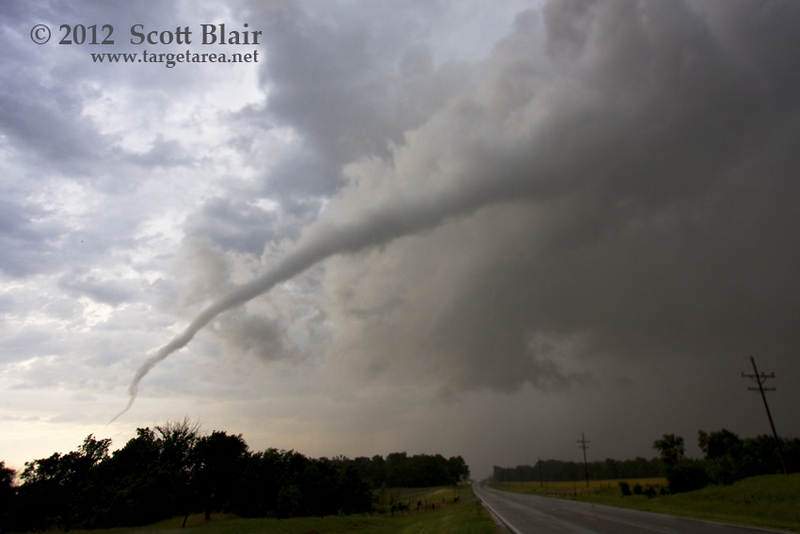 The tornado put on an impressive final show, roping out and stretching across the horizon. 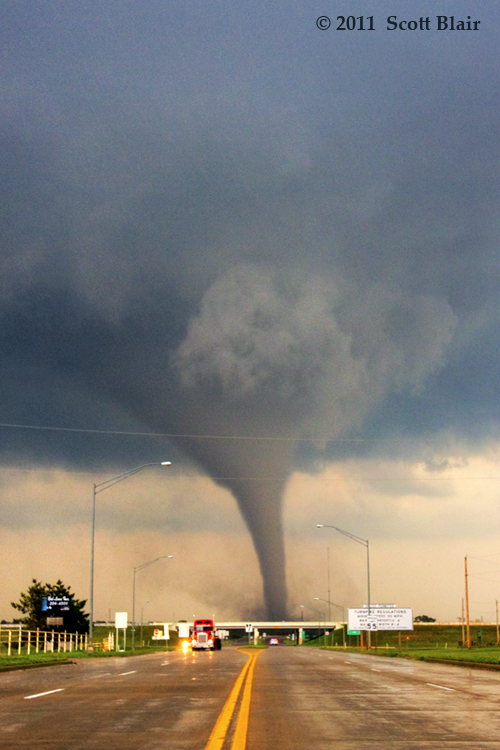 We carefully approached on the west side of the hook and let the partially rain-wrapped tornado cross the road. 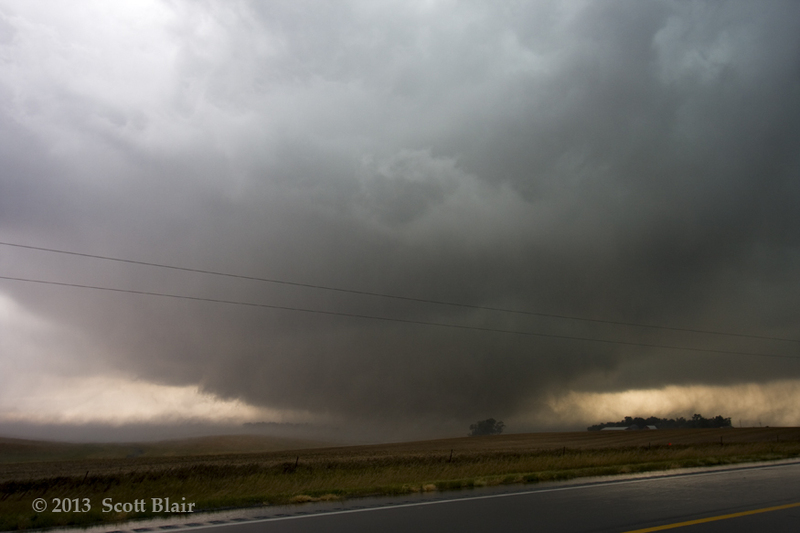 As the circulation passed, the tornado occluded just north of the road, providing a spectacular view of the exposed updraft tower. With time, the tornado narrowed and became increasingly visible as the vortex emerged from the lessening hook-echo precipitation. 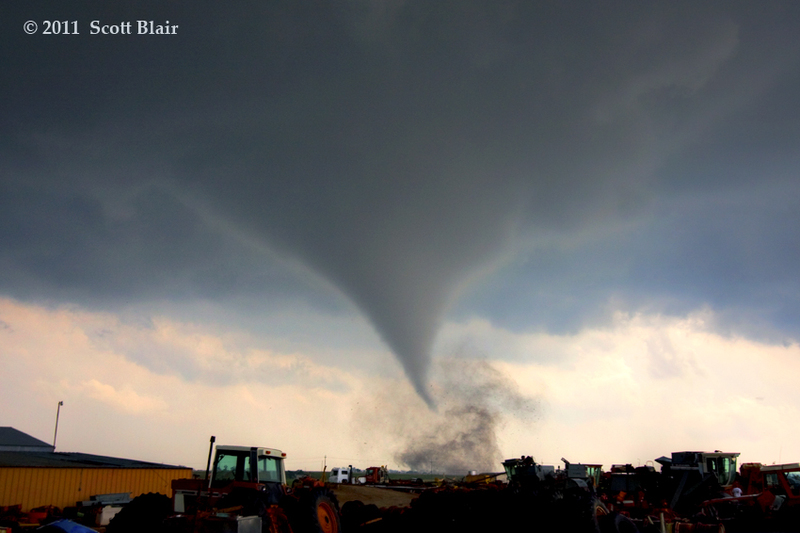 The tornado roped out near Bronson, IA while debris from earlier churned fields rained down upon us. 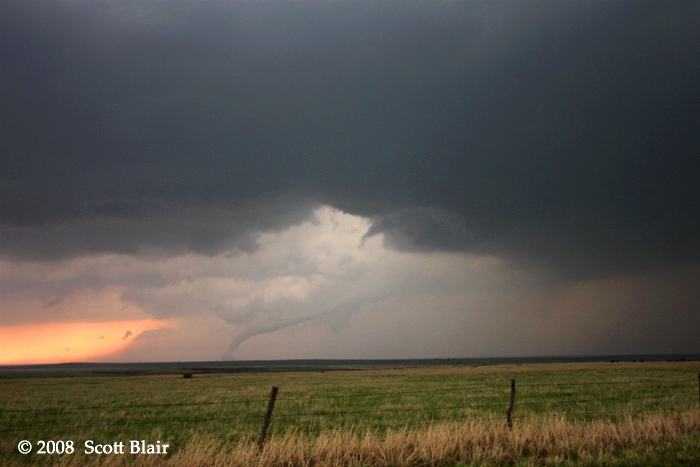 Very rapid visual tornadogenesis occurred with this tornado near Hitschmann, KS. 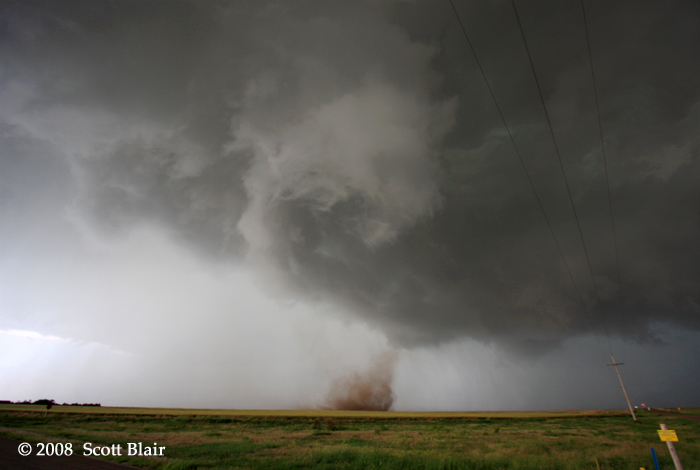 The tornado began as a dust bowl underneath strong, tight cloud base rotation. The initial single-cell vortex transitioned to a multi-vortex configuration as it passed us at an uncomfortably close range. It eventually fully condensed into an elephant trunk and roped out. 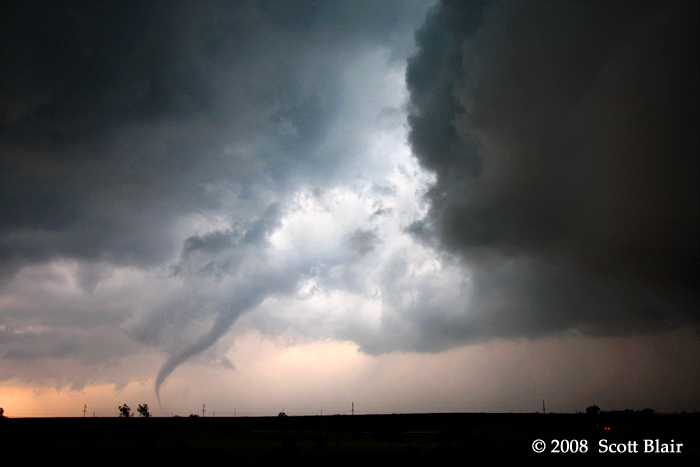 A regional tornado outbreak transpired from Nebraska into the Texas Panhandle on the afternoon and evening of 28 March 2007. 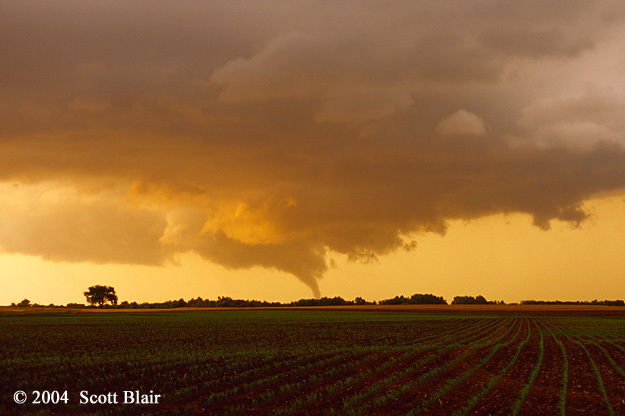 The tornado above was photographed on a very muddy road north of Edson, KS at sunset. The low sun angle transformed the condensed vortex bright red, providing a surreal moment before the color slowly faded. 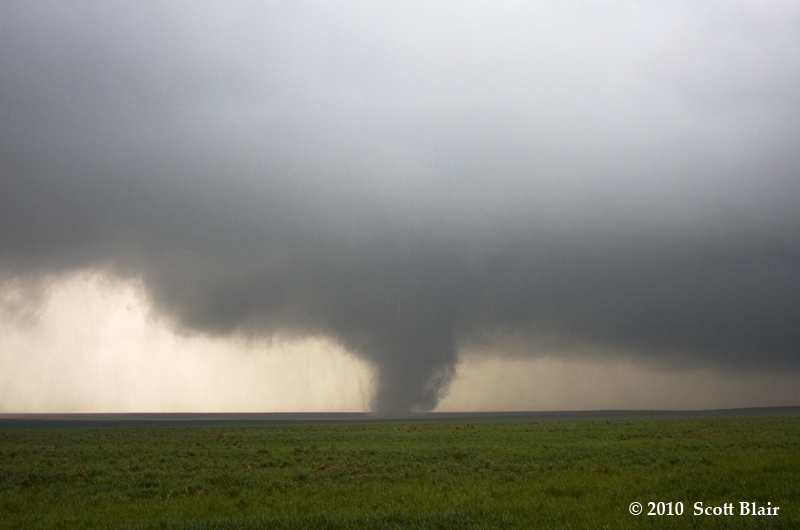 A two-day tornado outbreak occurred across portions of western Kansas on May 22-23, 2008. Supercells literally overlapped the same areas in Gove and Trego Counties. Limited road options, many of them mud-ridden, complicated by fast storm motions made for a difficult photogenic intercept. Above is a sample of the tornadoes observed. 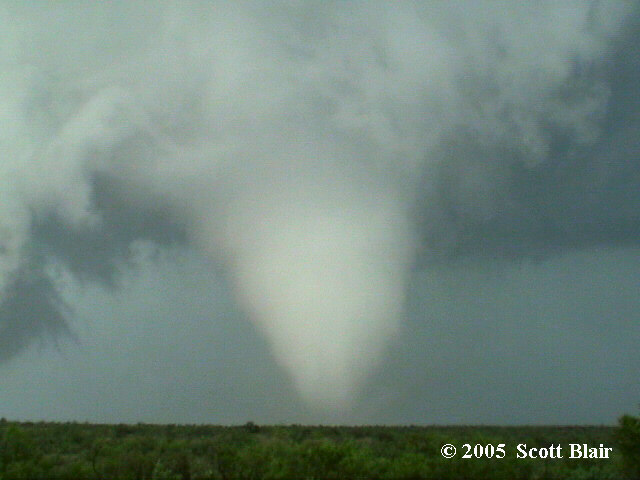 This tornado intermittently condensed fully to the ground and showed signs of debris, but likely persisted for nearly ten minutes during the evening of 22 May 2007. 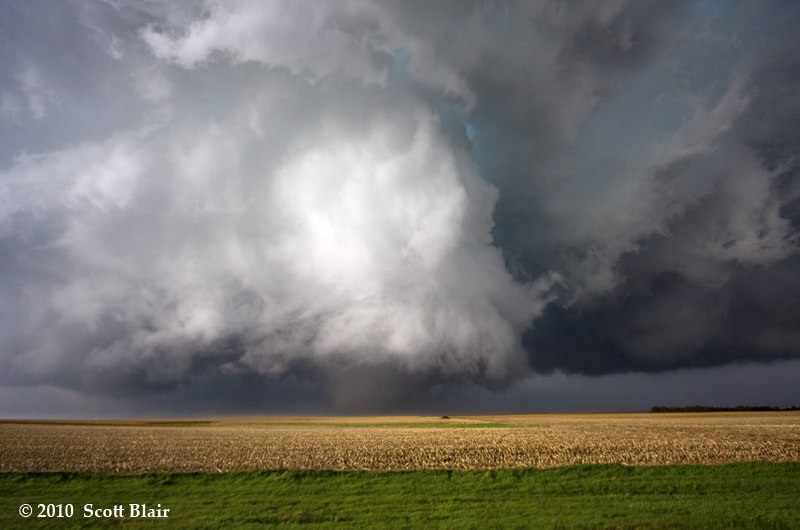 While the tornado had nice motion, it was the storm structure above in combination with the vortex present that made for an awe-inspiring event. 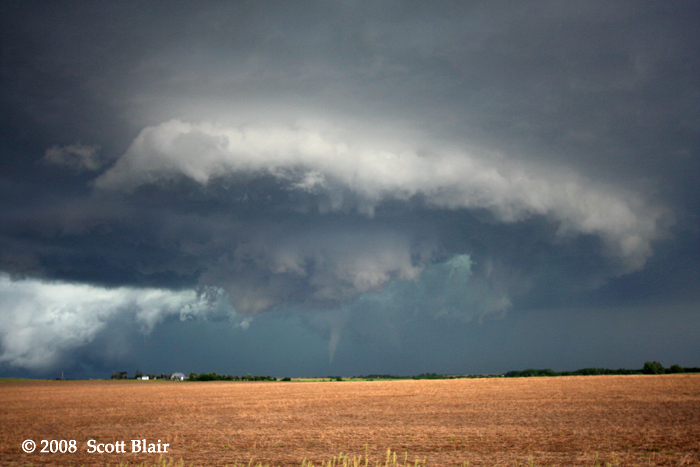 Good storm structure with a tornado is always a major plus. 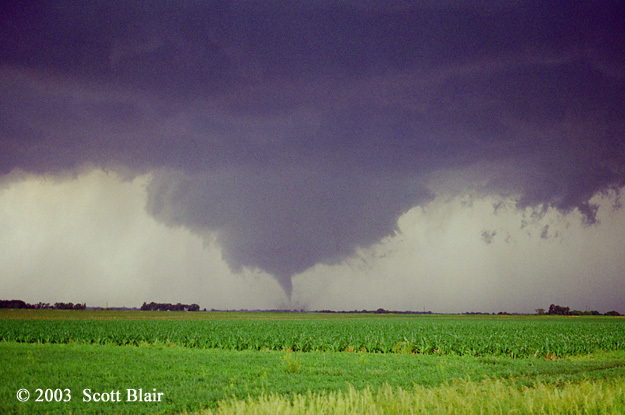 The most beautiful tornado I’ve witnessed to date on 12 June 2004 near Mulvane, KS. The images above are captured from digital video as I unfortunately failed to shoot any stills. Regardless, an amazing sight with a glowing white tornado contrasted against a dark blue sky, and even a stunning rainbow to finish. Its beauty was abruptly ended as the tornado destroyed a home resulting in at least F3 damage. 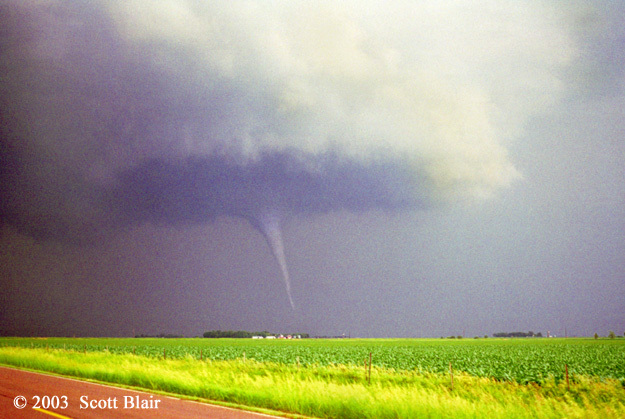 A localized tornado outbreak across eastern South Dakota occurred on 24 June 2003. 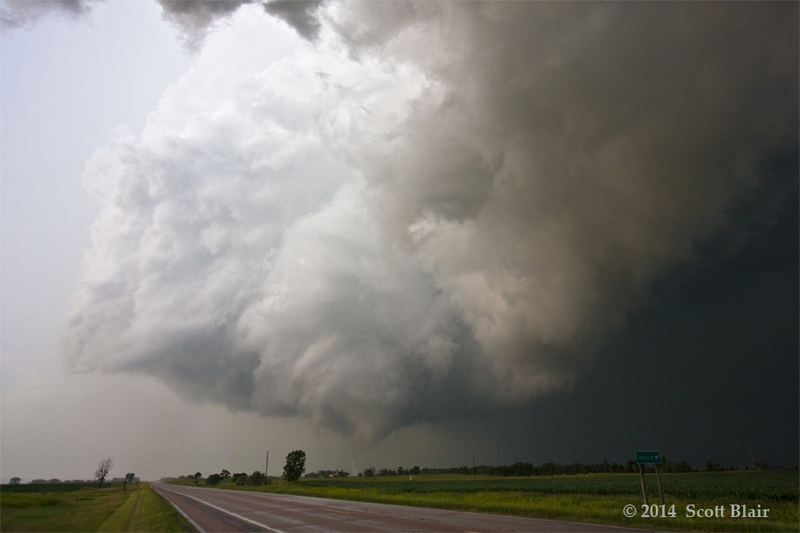 We were fortunate to observe 13 tornadoes from one cyclic supercell storm that moved northward near Centerville, SD. Many of the tornadoes moved northwestward as the updraft would occlude and a new tornado would form east of the ongoing tornado. 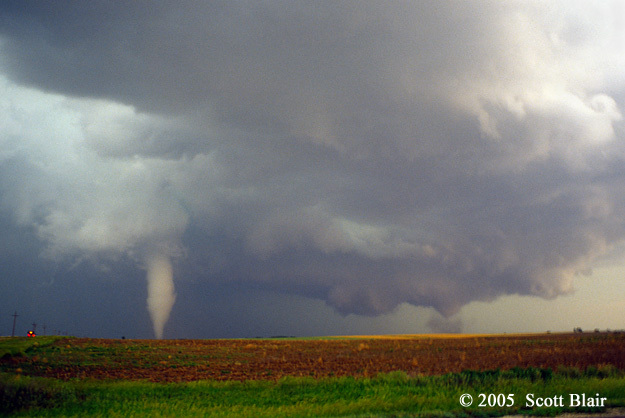 The chase spectacularly capped off the end of the 2003 chase season. 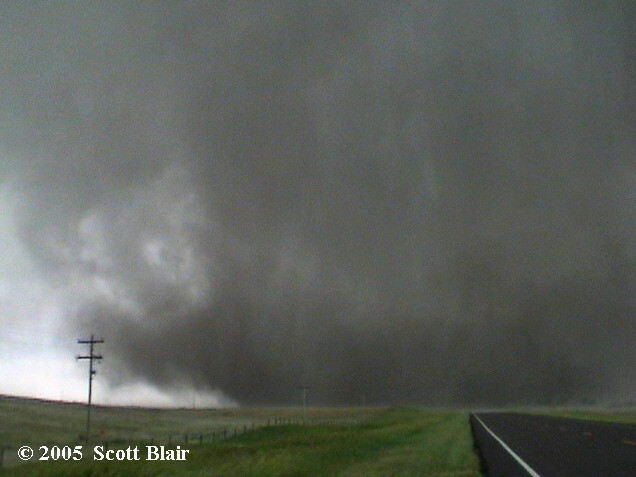 The long drive to southeast Montana paid off on 6 June 2005. I was already pleased observing a nice supercell in such a remote location, so when the tornado developed I could hardly keep my excitement contained. 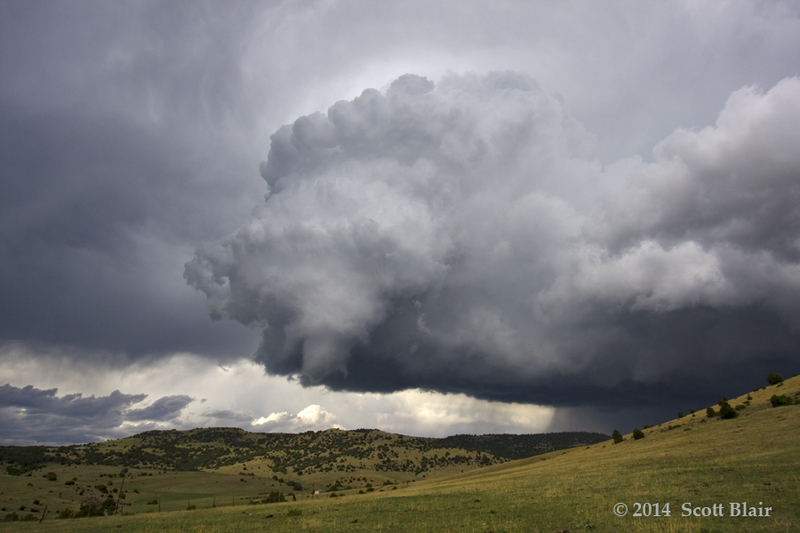 It’s very difficult to observe tornadoes in Montana due to the lack of roads and limited annual supercell frequency. 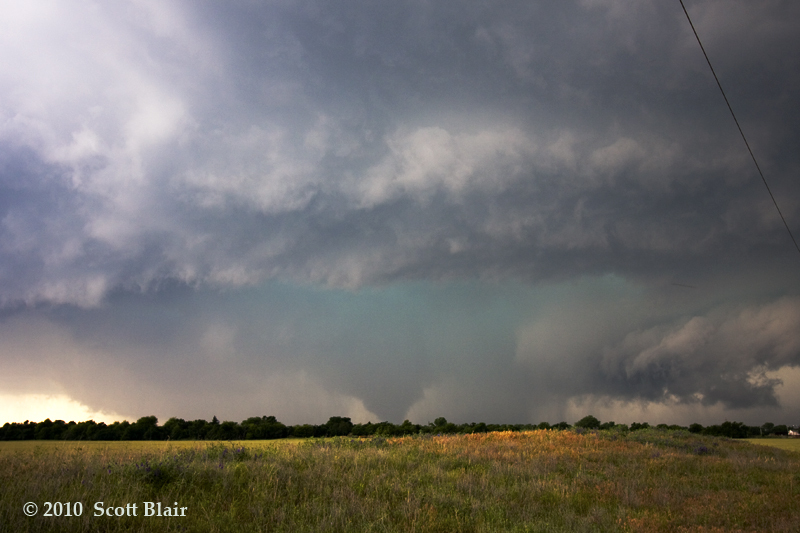 This scene was amazing, with lush green fields and a backlit tornado. 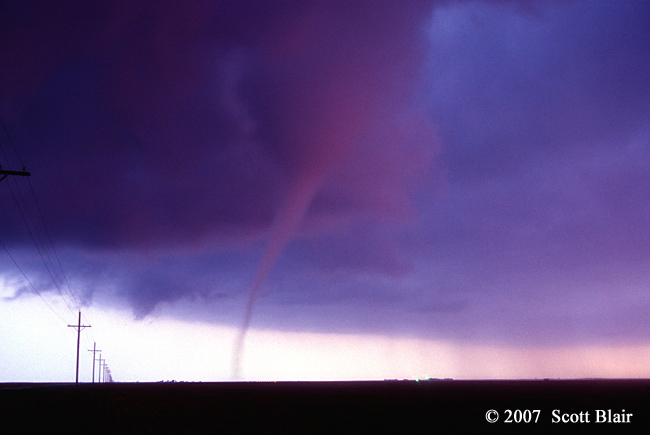 A tornado developed at sunset near Rock, KS on 12 June 2004. The low sun angle cast shades of orange and yellow throughout the updraft base and tornado. 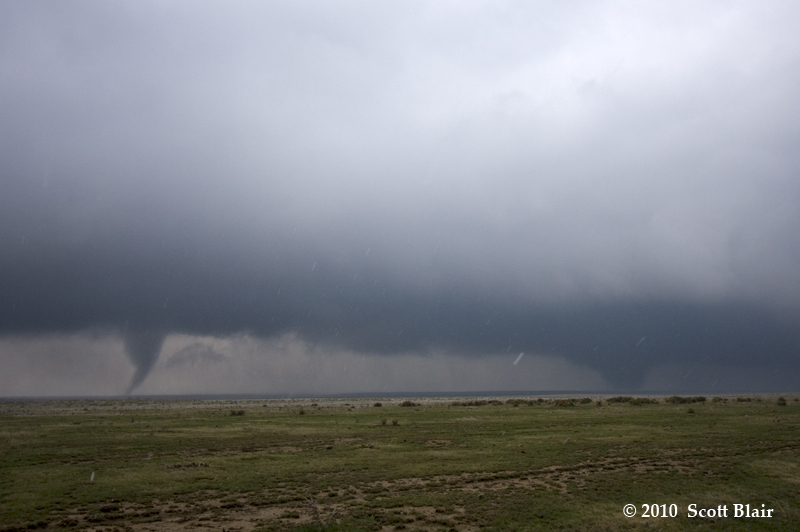 The view is looking north and the tornado was slowly moving northward, away from our location. 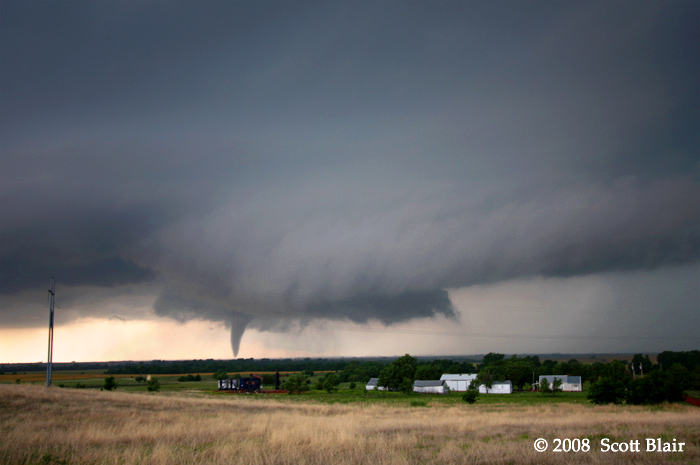 Only one tornado materialized from a highly anticipated severe weather setup across the plains states on 6 June 2007. 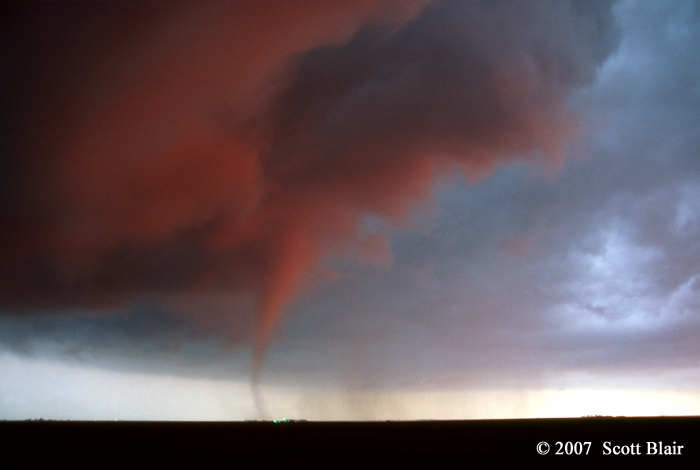 This tornado was observed from a good distance, but the foreground made the experience very unique. 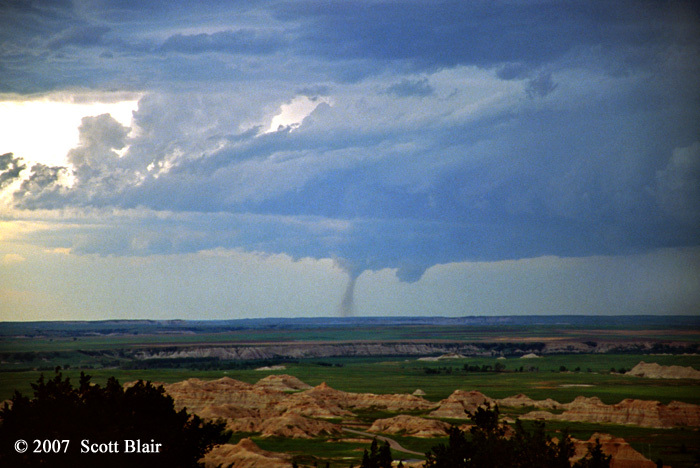 We remained stationary for nearly 30 minutes watching the slow-moving tornado over the beautiful Badlands National Park. 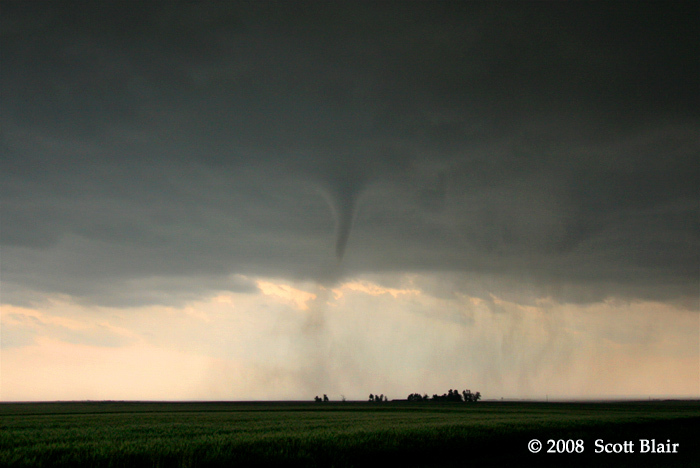 This was one of six tornadoes captured on 12 June 2005, but by far the most impressive and significant. I unfortunately ran out of slide film the previous day, so I settled for digital video. 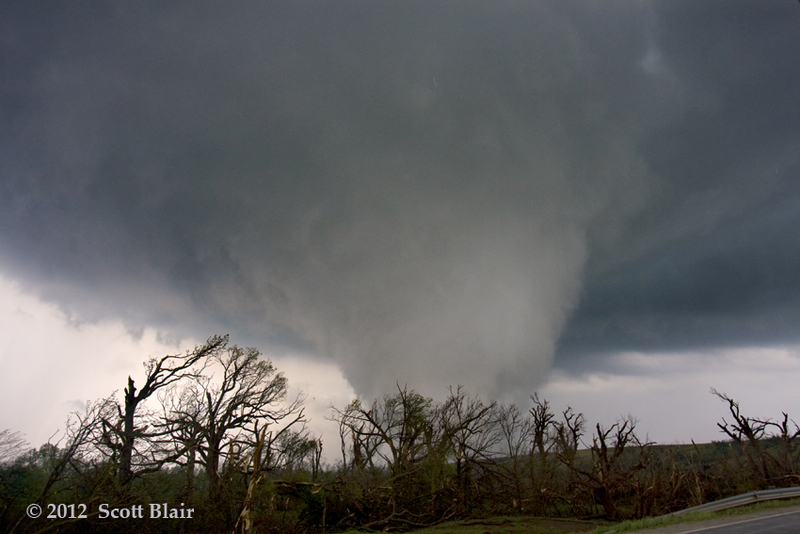 This tornado initially was a large white cone before morphing into a large dirt-filled wedge. © 1996-2015 - All pictures and images are copyrighted by Scott F. Blair. Any reproduction either electronic or otherwise is strickly prohibited by Federal Law.